At Tóchar Phádraig, pilgrims must register at Ballintubber Abbey before embarking on the 35 Km (22 mile) path to Croagh Patrick. The longest of the surviving pilgrimage roads is the Tóchar Phádraig, which leads to Croagh Patrick, the site of St Patrick’s first legendary battle with the devil’s mother and a flock of demon birds. On the last Sunday in July, around 30,000 pilgrims gather from all over Ireland to climb the Reek, as the holy mountain is known locally. 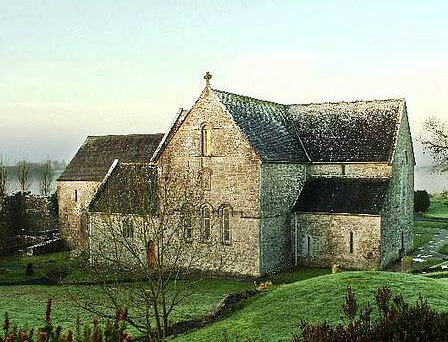 In ancient times, the Reek was approached from the east, and the route begins at the Augustinian Abbey of Ballintubber. In all probability, the pilgrimage goes back to pagan times, and it has been suggested that the route originally led from Cruachan, the seat of the prehistoric kings of Connaght. One possible indication of the pre-Christian origins of the road is a large boulder at Boheh. Known as St Patrick’s Chair, it is decorated with small circular hollows known as cup marks and probably dates from the Bronze Age. Founded in 1216 and refurbished in the 1960s, Ballintubber Abbey is one of the finest examples of the Romanesque style of architecture known as ‘the School of the West’. The route continues for many miles, passing through Aghagower where there is a round tower, a holy well, St Patrick’s Bed and his ‘Bath’. Soil from the base of the sacred tree by the bath is said to have curative powers. The road from Ballintubber was cleared by local initiative — in the process, a number of stone flags came to light, which must have belonged to the Tóchar Phádraig. At Lankill, a raised stone altar with a small cross-inscribed stone on top of it and an adjacent pillar stone probably date from the Early Christian Era. A nearby holy well is attributed to St Brendan. Below you can see a picture of pilgrims walking the Tóchar from Ballintubber Abbey.